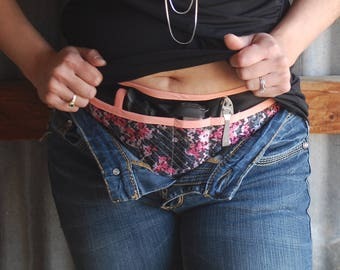 Announcement This is your place to find comfortable concealed carry holsters for men and women! 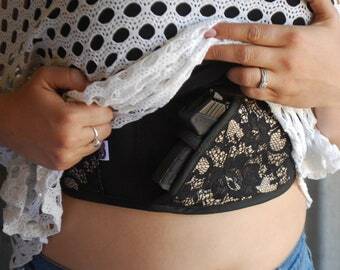 We offer IWB holsters, bra holsters, and thigh holsters. All holster are handmade right here in the USA, with a commitment to quality and excellent customer service. Current turnaround time is 3 weeks. 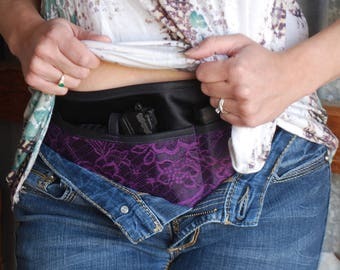 This is your place to find comfortable concealed carry holsters for men and women! We offer IWB holsters, bra holsters, and thigh holsters. All holster are handmade right here in the USA, with a commitment to quality and excellent customer service. My second order...needed a new color for my new gun! Just as perfect as the first one. 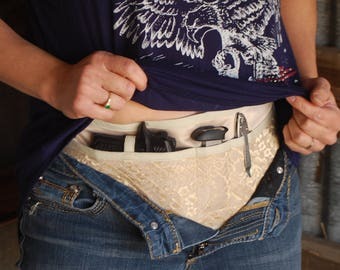 By far the best holster for women. Secure feeling, hidden well, easy to get to, and don't have to half undress to use the facilities (or risk having the gun hit the floor). Love, love, love it! I love how well it conceals my gun. I can wear it with almost anything and is super comfy! Thank you! 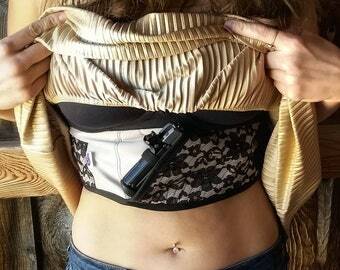 Custom made Concealed Carry holsters for both men and women. Where quality, function and comfort meet. Let me share a little of my passion for beautiful things with you....it all started with an addiction to fabric, which quickly turned into a driving desire to make everyday, practical and usually utilitarian items into something that was a pleasure to look at as well as use. Every holster is made by myself, from start to finish, and tested to make sure it will fit the specific gun it is made for. I only use materials that are manufactured here in the USA, and firmly believe in supporting local as well as national business. I hope you find some of that joy reflected in the things that I make and the materials I use. I can't wait to hear from you! Born and raised in Europe, emigrated to the US as a teen, educated in graphic design, married a Marine, mommie to one amazing boy, and am loving living in AZ, creating custom, one-of-a-kind holsters for women of all shapes and sizes! Welcome to my shop! please do feel free to message me first if you have any questions about which holster would be best for you/your gun, if you'd like a custom item made, or have any other questions! I offer a full refund (minus tax/shipping), if the order is either cancelled, or if you return an item (as long as it's still in perfect condition). Items bought on Sale are not eligible for a refund. I am not responsible for items lost in the mail or stolen. If the holster you return to me is stained or otherwise damaged, a full refund will not be issued. Full refunds only good if the holster is still in 'New' condition, and returned within 30 days of purchase. You may cancel an order anytime before it ships. My current turnaround time is 3-4 weeks. If you need a holster by a certain deadline or are in a rush, please let me know at the time of ordering, so I can be sure to get it out as fast as possible. If you ever have a problem with your holster, please message me and I will do my best to resolve the issue. If the elastic wears out, you need extra velcro tabs to protect clothing, or you need new velcro or elastic attached for any reason, just shoot me a message, mail back the holster, and I will repair it for a small fee to cover materials and shipping....this offer is good for the lifetime of the holster. 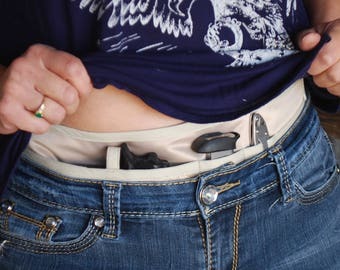 For the IWB holster: measure around your pant waistband area. If you're in between sizes, select the smaller one and add a comment at checkout with your actual size. For the Thigh holster: measure at mid thigh, or wherever you plan to wear it. If you're pregnant: select your current size, and then comment that you're expecting and how much more you thing you'll grow. Extenders are available, which will give you more wiggle room in sizing, and can be removed as you lose weight. If you're losing weight: Give your current size, and comment with your goal size in inches if you can. An extender may be beneficial until you reach your goal. All holsters are machine washable. Wash in cool water on a gentle cycle, using a mild detergent, no bleach. Be sure to close the velcro tabs so that they don't catch on anything else in the machine. You can hang to dry, or use the tumble dryer on the delicate setting. The holster may warp slightly if dried in the machine. If the elastic seems to be losing some of it's stretch, cover with a thin cloth, and iron on a medium setting to restore some tightness. We do offer wholesale packages in an assortment of options, so please email me at fancypantsholsters@gmail.com for details!